Do you enjoy spending time in nature, but can’t imagine leaving behind the creature comforts of home? If so, you should try glamping, or glamorous camping. It like regular camping with a luxurious twist. Unless you plan to shell out the big bucks to rent an already set-up glamping site, the art of glamping might seem complicated and time consuming. But there are ways to create your very own glamping experience without undergoing a lot of hassle. We’ve gathered eight tips for making your glamping experience super comfortable and super easy. 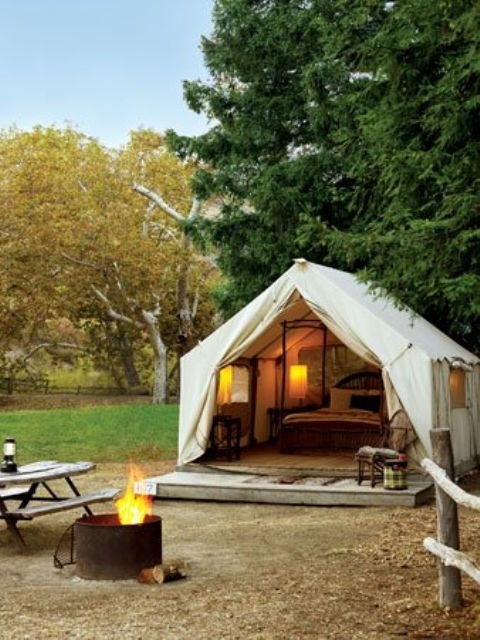 Get ready to go glamping like a pro! One of the most important things for any glamping trip is the tent. It protects you from the elements and provides a safe place to sleep. A typical glamping tent is tall enough to stand up in and big enough to hold some basic luxury items. 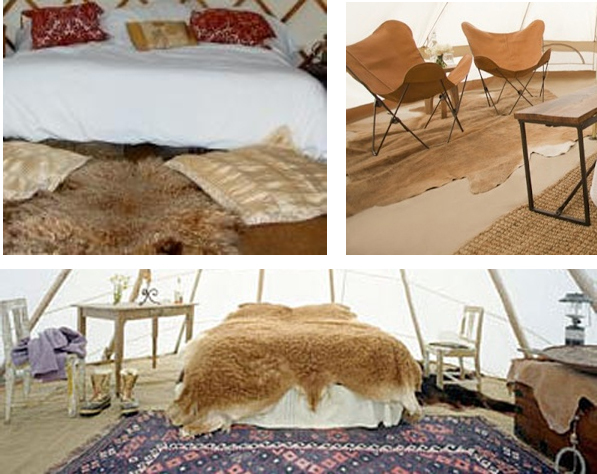 If you want to move up to the next level of glamping look for a bell tent or canvas wall tent. These tents tend to be expensive (approximately $1000) so don’t be afraid to start off smaller. If you would like a big tent but don’t want to foot the bill, check out places like Craigslist or eBay for cheaper, used options. The second most important item to have on a glamping trip is a good floor. 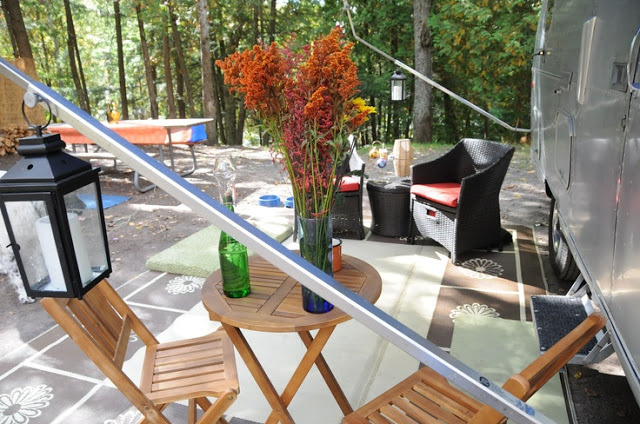 If you are lucky enough to find a campsite that has a wooden platform, you can move on the to the next step. But if your site does not have a wooden platform, simply bring your own. Go to any home improvement store and for less than $2 a square foot buy a piece of faux wood sheet vinyl that is roughly the size of your tent floor. Not only will having a floor make you tent feel more like home, but it will also make the ground more comfortable, and help your living area stay clean. To make the space even more comfortable, consider adding a few area rugs. Some good choices are cowhide, sheepskin, natural weave, or Moroccan. It is possible to find some affordable flat woven rugs at IKEA. They also have some great looking cowhide rugs but they can be a little on the expensive side ($200). If this is too rich for your blood, IKEA also offers great faux sheepskin rugs that are less than $20. Now that you have walls and a floor it’s time to fill the space with glamping comfort, starting with the bed. Many glampers love a wooden bed frame. But it’s just not practical to haul around in your vehicle when you’re going camping. Especially when you have to go through the hassle of setting it up and tearing it down once the vacation is over. As an alternative, try an airbed that looks like a regular bed. You know the kind that are about 2 feet thick and sit high above the floor. For even more comfort, add a 4-inch memory foam mattress topper. They can make even the most uncomfortable bed feel like heaven. If you prefer a hard bed, consider getting a cot that has a built in mattress. The final step in creating a glamping bed is the linens. N0, we’re not talking about a sleeping bag and a rolled up coat for a pillow. This is glamping! If you want to disguise the fact that you are using an air mattress bring along a fitted sheet and bed skirt. Others ways to glamp up the bed are lots of fancy pillows and a pretty patterned throw blanket draped over the foot of the bed. Along with the bed you’re going to want some additional furniture to make the space feel like a true glamping tent. The best way to easily add furniture to your glamping repertoire is by choosing items that serve more than one purpose, or are easy to fold away and transport. For example, consider packing your clothes in a wicker chest. Not only is it lightweight and able to hold a lot (because glamping can sometimes require more than a few outfit changes), but it also turns into a charming accent piece when placed at the foot of the bed. You can find wicker chests at strores like Walmart or Target for less than $40. When it comes to seating, you will want to look for something that’s lightweight, comfortable, and, of course, charming and cute. Also, if you plan on getting a chair, consider getting two. A pair always adds more symmetry to the space. Butterfly chairs are a great option because they can be folded. The best looking ones are made out of leather, but canvas looks awesome as well. You can find them for around $60 or less on eBay. Walmart sells bamboo folding chairs for less than $40. Director chairs are also a great choice and they are fairly inexpensive selling at Walmart for less than $40. If you want to try something different, consider inflatable chairs. The Chesterfield brand offers some interesting choices of both sofas and chairs. Poufs are another great option that will add comfort and variety to the space. 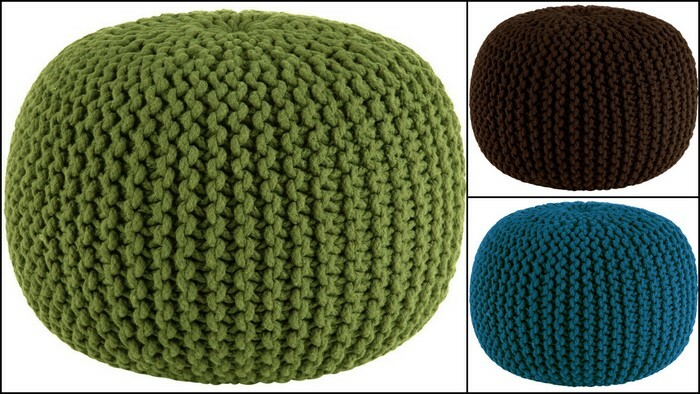 Check out this cute knitted poufs available from Amazon in a variety of colors for $60. In addition to chairs, you will need also need some side tables to place on either side of the bed. For this function, Walmart has beautiful sea grass cubes for around $20. Not only are they light, but you can also use them for storage. IKEA also has some decent looking wooden side tables for less than $30. If you want something to dine on, Amazon has a fantastic wooden folding table for less than $60. The next step is to set the mood with some lighting. 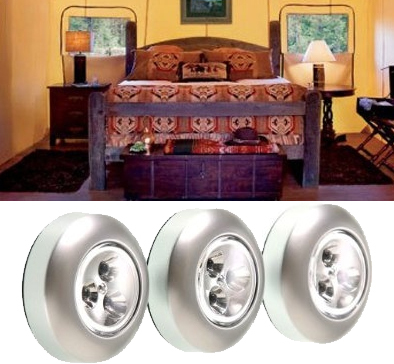 The most traditional type of glamping lights are lamps. Not only do they look pretty, but the give the space a nice soothing glow when placed on your side tables. 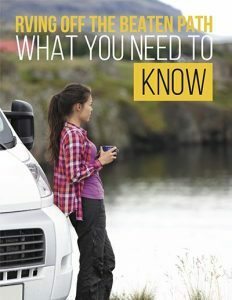 If electricity is not available at your camp site, don’t panic. Simply get some puck shaped LED lights and put them where the bulbs would go. You may have to use double sided sticky tape to make sure that they stay in place. Traditional looking battery operated lanterns are also a great option. You can find some great choices for less than $20 on Amazon. Now it’s time for the fun details. To add even more dimension to the space you will need some extra items such as vases, picture frames, figurines, and flowers. The dollar store has some great lightweight picture frames that you can hang with 3M products. As for you flowers, buy a vase at the dollar store and decorate it with fresh wildflowers from your hike. Just because you are in the great outdoors doesn’t mean you have to suffer from extreme heat or cold. Some may think that controlling the temperature defeats the purpose of camping. But remember, this is not camping — it’s glamping, and comfort is the name of the game. If you are one of those people who can’t stand the cold or heat, bringing a heater or fan on your trip is vital. Many of the larger tents come with vents for just such a purpose. If your glamping site has electricity, bring a evaporative cooler or portable air conditioner. You can probably find a great one on Craigslist. The only thing is that you must make sure that your tent is airtight for it to work properly. If you want a heater, a freestanding electric stove heater will make the space more cozy. If you prefer to keep things simple, a retro looking fan is an excellent option. If your site doesn’t have electricity, you can buy a battery operated Ryobi fan for around $30. These use a lithium battery that lasts for around 10 hours before needing another charge. It is important to note that you may have to buy a battery because it doesn’t come with one. Thankfully, many Ryobi products have interchangeable batteries. So, if you own any other Ryobi tools, you can probably use their battery instead of buying a new battery. Also, they come in an ugly green color but this can easily be remedied with spray paint in your favorite color. Last but not least, you will need a couple of extras to make your glamping experience complete. You may want to bring a few toys to enjoy the outdoors like kayaks, bikes, and an outdoor movie kit. You can find a great portable screen for less than $70 on eBay. Vivitek makes a decent projector that you can find at Best Buy for less than $400. Keep in mind though, that depending on the proximity of your neighbors, you may have to limit your movie watching to inside your tent because it produces a lot of light. 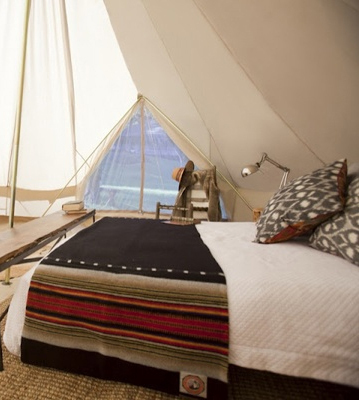 Are You Ready to Get Glamping? There you have it. Eight tips for glamping like a pro without breaking the bank or dragging around a lot of large heavy items. 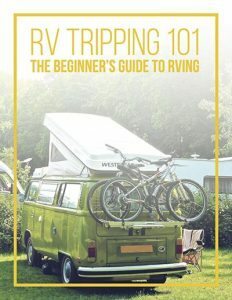 Because glamping is supposed to be fun! Happy Glamping! If there’s any thing that I’ve forgotten, please feel free to mention it in the comments below.